Marvel's own Milwaukee-based Misfits are back-in their very own, double sized X-mas special! 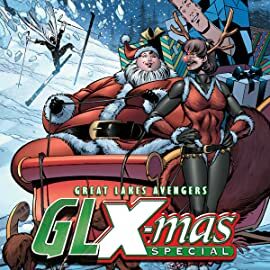 Sure, they survived the GLA mini-series, but can Squirrel Girl, Mr. Immortal, and pals survive... the HOLIDAYS? 6 all-new features of mockery, morbidity, and merriment-- including the return of Grasshopper, Deathurge...and the Yuletide tyranny of Dr. Tannenbaum? !